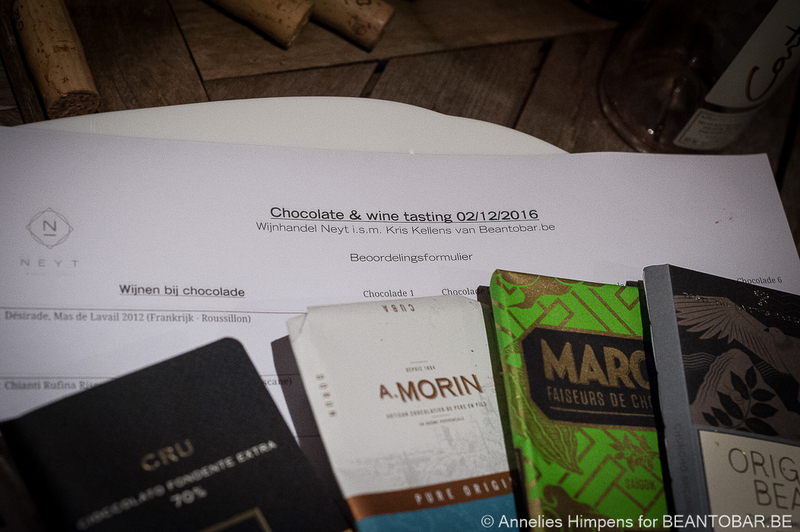 On the first friday of December, Wijnhandel Neyt from Waarschoot and Beantobar.be came together to organise a wine and chocolate pairing. 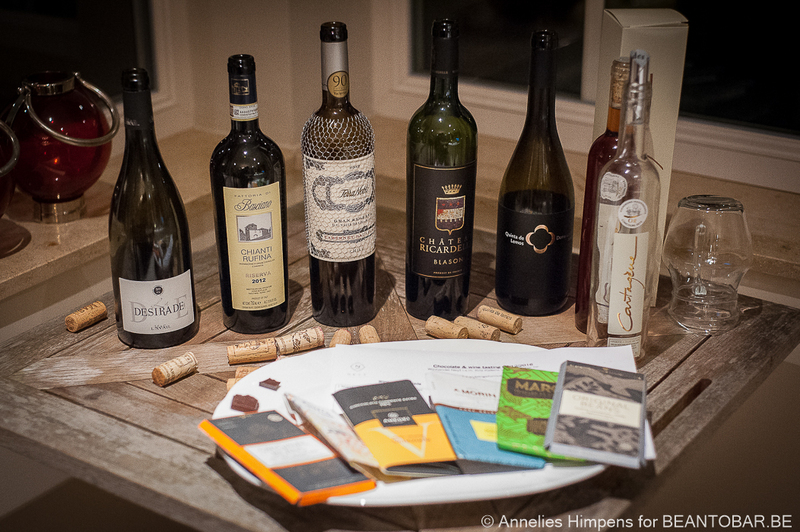 After a selection round of chocolates, 6 different bars were selected and paired to six different wines. As more chocolates came to the table, so did the wines. 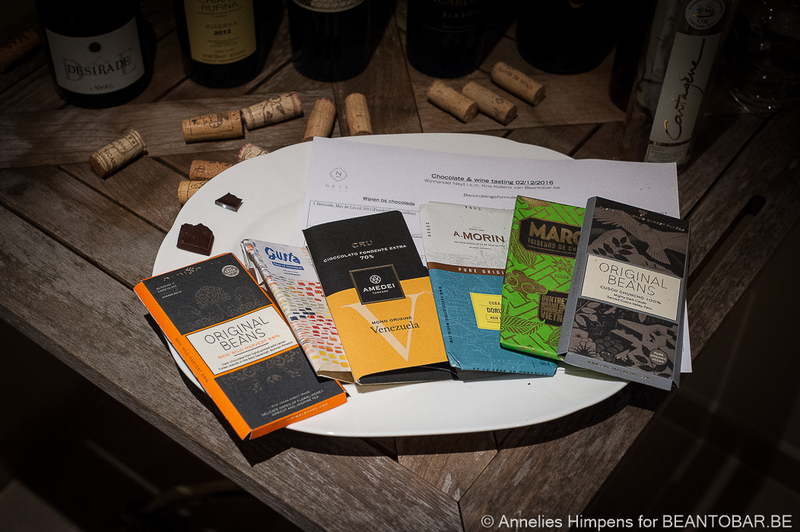 Every participant had 3 wines on the table at all times, giving them the possibility to not only try the pairs thought op by us – but also try other wines with one chocolate. The audience was new to the world of fine origin chocolate and once more, many were surprised by the product. Tania, hostess of the evening, selected specific wines to match the destinct character of every bar. In the end, a lively conversation about wines, chocolates, cocoa and personal taste evolved. A wonderful evening indeed. The line-up of the evening. The floral flavor of the Bolivian Beni Wild Harvest with notes of apricot and jasmin, paired very nicely with the delicate finesse of the Côtes Du Rousillon Villages presented in the glass. Many people loved this combination as both showed a rounded flavor profile and blended together. The Gusta chocoate brought a lot of red fruits to the table. It was paired with an Italian Chianti, showing remarkable similar acedic notes. Fresh, zingy cherry fruits with a smoky afterflavor, the wine followed the main flavor of the Peru origin Gusta bar. Yet it was clear the fruity notes are a very personal taste and some people loved the first combination better, while others like me just adore these flavors. The Amadei bar showed clear roasted nut flavors, combined with a hint of citrus – typical for Venezuelan cocoa. The Chilean Terra Noble has bold and rich flavors, showing round fruits, chocolate, coffee and vanilla on offer which brought a nice counteract for the nutty flavors of the chocolate. One of the star chocolates of the evening, the Cuba bar of Morin was earthy and showing lots of tobacco, dark plums and molasses. In the glass, a French Languedoc La Clape wine appeared. The Chateau Richardelle Blasson shows equal earthy notes in the aroma. It reminded me of dark fruit jam, leather and a hint of smoke. Far less fruity than the wines before it flowed alongside the Cuba bar perfectly. The smoky tobacco flavors of the chocolate matched the flavor evolution of the wine and the tannins in the wine formed made the overall flavor punchy. One of my favotire combinations. Still a bit sweet, someone replied when I asked how they liked the chocolates so far. He was happy to see a Vietnamese 78% bar appear. The Marou chocolate is very generous in flavor. It resists the melt and has a more fatty mouthfeel, requiring a wine that could match it’s character. Tania served an aged Portuguese wine made from Touriga Nacional grapes. The oldest wine of the table has well matured and has a very round mouthfeel. With just a hint of fruity acids, lush preserved fruits and well tamed tannins, it cut beautifully through the flavor of the Marou bar and lifted the overall flavor to a higher level. The best match of the evening for several people. Quiet a shock to many, this Peruvian 100% bar. Cacao in it’s purest with bold earthy flavors of grass, chestnut and even some chocolate and raisin in the back. This bar simply overpowers every red wine, leaving onothing but the high fruits alive. So the natural choice was the offer a sweet wine with this bar. The Cartagène Chateau Ricardelle made a sweet counterpart to the intense chocolate. This natural sweet wine is matured in wooden barrels placed outside in the sun. It results in complex not overly sweet wine able to tame the wild flavors of the 100% Cusco Chuncho bar. Not everybodies cup of tea – 100% chocolate is something very different, yet as always there were some who could really enjoy this type of bar. The evening was a very enjoyable experiment, showing that two complex products can be paired to achieve an even more special flavor sensation, yet it is not as easy as it seems. Pairing both products gave me the chance to introduce people to fine flavor chocolate and also made people sample their wine in a different way. As I have noticed before, people who are interested in flavor (being it wine, whisky, gin, cheese,…) always enjoy discovering fine origin chocolate as well. Ad this is what it is all about. Discovering flavors and enjoying them.